Friday the 13th Part 3 is probably the most iconic installment in the Friday 13th franchise. With that entry the killer went from son of the first killer, with sack on head, to the iconic Jason Voorhees. But what makes Jason stand out above everyone, barring Myers, is his white goalie mask with red chevrons. That image is now one of pop-cultural significance and ingrained in the minds of people the world over. 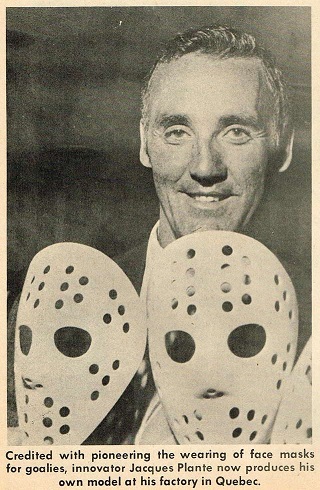 On November 1, 1959, Montreal Canadien Jacques Plante becomes the first NHL goaltender to wear a full facemask. Teammates, opponents, fans and reporters mocked Plante mercilessly about it, but Plante didn’t care. “I already had four broken noses, a broken jaw, two broken cheekbones and almost 200 stitches in my head,” he pointed out. “I didn’t care how the mask looked.” And the truth is that Plante was such a good goalie that it almost didn’t matter what he did. Once it caught on, most goaltenders wore Plante-designed masks until the end of the 1960s, when Soviet goalies introduced cage-style masks that made it easier to see. That brings us to Martin Jay Sadoff The 3D Supervisor on Friday the 13th part 3 and editor on part 7. 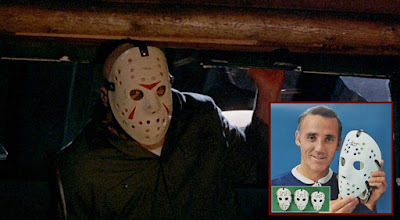 Now there are many conflicting reports on who decided to put the mask on Jason, even Cunningham thought it was Steve Miner's idea because he was shooting hockey documentaries (this is untrue on many levels). But the consensus is that Sadoff grabbed the mask for a makeup test, from the trunk of his car, and when Miner saw it he instantly fell in love with it. The only hitch was that the mask was a medium sized Plante mask and it needed to be reworked to fit Richard Brooker's head. Sadoff confirmed this during a panel discussion at the 2007 Screamfest LA Film Festival. "The day of the makeup test, we didn't really know what Jason should really look like," Sadoff told the crowd. "We had to come up with some kind of makeup test in 3-D. I had a hockey mask there and I said, 'Why don't we put it on and see what it looks like?' I only wish I had registered the hockey mask [as a trademark] because every Halloween, that's all I see!" That, my friends, is how hockey came to have goalies with facemasks and the horror genre gained an iconic slasher. Just think, if Plante didn't get wacked with a puck, and make the mask a necessary piece of hockey equipment, then we would never have gotten the Jason Voorhees that we know and love today.